Hadaki is known for its fun, original and affordable bags. There are totes, shoulder bags, messenger bags, weekend travel bags and many more types. Each size comes in a variety of popular colors and designs, and now the proceeds will help more than just the company. Hadaki announced that 10 percent of all June sales will go directly to the Audubon Nature Institute’s Wildlife Rescue Program to help the animals affected by the recent devastating Gulf oil spill. There are countless numbers of animals in grave danger because of the spill, and the number continues to grow. Audubon is doing everything they can to help all the victims, and now you can help, too. The Audubon Nature Institute is a Louisiana based not-for-profit organization composed of nine major museums and parks all dedicated to the education and survival of nature. Audubon is on the forefront of helping the victims of the Gulf oil spill, and many companies, like Hadaki, are developing partnerships with Audubon to help the animals. It’s a great way to help our community, and look great while doing it. Do your part in helping the animals affected by the oil spill by buying one of Hadaki’s great bags! Still stuck on what to get dad for Father’s Day? I’ve got an idea for you. Try a Grand Band money clip. They come in your choice of stainless steel or sterling silver, and there are eight different designs to choose from. Most plates can be engraved so you can make sure that your gift is personal, original and meaningful. Whether Dad is a golfer, banker, teacher, doctor or anything else, he still needs something to hold his cash, credit or business cards together. The Grand Band is the perfect accessory to hold everything. Wallets can sometimes be bulky to carry around in your pocket all day long, so the Grand Band is a sleek new alternative to the wallet. Waterford and Waterman on Sale Now! I didn’t always understand the demand for nice pens. Throughout my entire school career, I used whatever I bought at Walgreens or office depot, and they worked just fine. It wasn’t until I started seeing these other types of pens that it hit me. Pens can truly be beautiful accessories to any desk, and there is a monumental difference between the Walgreens Bic and a Waterman or Waterford fine writing instrument. Waterman and Waterford Pens have elegantly and intricately designed pens, and they are now on sale at Executive Essentials. If there was ever a time to invest in this type of product, it’s now. Whether you need a gift for Father’s Day, a graduation present, or just think it’s time to add some class to your desk, Waterman and Waterford have the pens and prices for you. Just to highlight a few, the Waterford Rainbow Arista Prism Rollerball Pen is a good pick. Its contemporary colors and shape come in your choice of multicolored mocha or rainbow, and marbled caramel or purple. Polished chrome appointments accompany each pen to make them stand out from any other design. Another good choice would be the Waterman Expert II Ballpoint Pen in Dune Blue. The vibrant gold trims, deep blue lacquer, and mesmerizing reflective effect ensure a distinct elegance and originality. Of course, you should browse the selection for yourself because there are more than 20 designs on sale. With colors ranging from fire engine red to deep sea blue, there is sure to be a pen for you. Author ReneePosted on August 2, 2017 August 3, 2017 Categories PensTags Ballpoint Pens, Fine Pens, Pens, Pens On Sale, Rollerball Pens, Waterford, Waterford Pens, Waterford Rainbow Arista Prism Rollerball Pen, Waterman, Waterman Expert II Ballpoint Pen, Waterman Pens, Writing InstrumentsLeave a comment on Waterford and Waterman on Sale Now! Yes, you read that title correctly. Diamonds. No, I don’t mean the pens have a shiny gloss finish or some sort of crystal design. I don’t mean there is a diamond designed painted on. I mean straight from the ground, carbon rock, beautiful brilliant diamonds. Montblanc released two pens as part of the already exquisite Meisterstuck LeGrand Collection: one ballpoint and one fountain pen. The fountain pen is equipped with a 14 K gold nib rhodium-plated inlay, precious black resin barrel and cap, and platinum plated clip and rings. As if that weren’t enough, the real catch with this one is the .06 ct. diamond in the cap top of the pen. It looks like it’s suspended in midair. I mean, it doesn’t get much cooler, sleeker or original than that. The ballpoint shares the same remarkable and distinguishing diamond as well as all of the other features as the fountain pen. If there were ever a pen to invest in, this is it. Every part of this pen was thoughtfully designed and executed, and you are sure to make a statement with it. The floating diamond will mesmerize any eye as you write, and act as the perfect complement to your desk. I wouldn’t wait too long to order mine! Ingrid Bergman, one of Hollywood’s finest, with three Academy Awards, two Emmy Awards, and a Tony Award, is being honored by Montblanc with three exquisite pens. 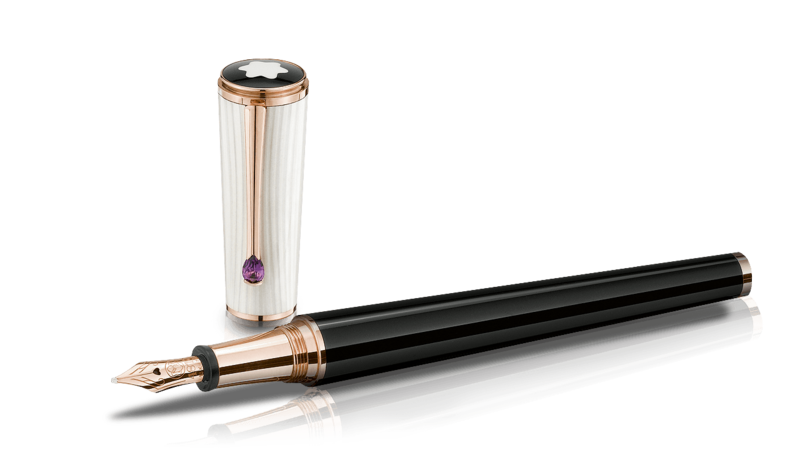 The Montblanc Ingrid Bergman La Donna Special Edition Fountain, Rollerball and Ballpoint Pens are made with the finest materials and the uncompromising craftsmanship that is Montblanc. Inspired by Ingrid Bergman’s era, the 1940’s, the pen has exquisite details and will wow even the most discerning pen lover. The mother of pearl styled lacquered caps, the 18K gold nibs, the teardrop amethysts, the rose gold accents and Ingrid Bergman’s signature is but a few of the refined details that make these pens so luxurious. Alongside Ingrid Bergman, Montblanc’s Women’s Collection also honors another wonderful artist who made great contributions to her field, literature, Virginia Woolf, with the Montblanc Virginia Woolf Special Edition Pen. Montblanc not only makes some of the finest pens in the world, it also chooses some of the finest women to model their pens after. Here’s looking at you Montblanc! Since 1906 Montblanc has passed the art of pen manufacturing from one generation to the next; resulting in the creation of the finest pens available in the world. So what better name for a pen collection from Montblanc than the Montblanc Generation Collection! Montblanc Generation Pens comprise all the best characteristics of fine writing instruments that Montblanc has developed generation after generation. The stainless steel tips, the precious black resin barrels and caps and the platinum plated rings and clips all contribute to the superiority of these pens! As Montblanc declares “the Montblanc Generation Collection is sure to please first-time Montblanc purchasers as well as long-time fans. Exquisite craftsmanship and superb materials are the hallmarks of this sophisticated collection. Montblanc the symbol of excellence, generation after generation! Meisterstuck, German for masterpiece. “Masterpiece in modern usage refers to a creation that has been given much critical praise, especially one that is considered the greatest work of a person’s career or to a work of outstanding creativity, skill or workmanship.” Undisputed, the Montblanc Meisterstuck Pen is well deserving of its name! Meisterstuck, German for masterpiece………. Experience the Meisterstuck that is Montblanc!